Hide this Project (VGN Minerva) Discover properties in other projects by hiding the ones that doesn't interest you. You won't see them in your searches further but you can unhide anytime later. Hide this Dealer (Anil Sangra) Discover properties by other dealers by hiding those whom you have already spoken to. You won't see them in your searches further but you can unhide anytime later. Hide this Dealer (Vaisanavi) Discover properties by other dealers by hiding those whom you have already spoken to. You won't see them in your searches further but you can unhide anytime later. Hide this Dealer (Diganta Sarma) Discover properties by other dealers by hiding those whom you have already spoken to. You won't see them in your searches further but you can unhide anytime later. Hide this Dealer (SR Estates)Discover properties by other dealers by hiding those whom you have already spoken to. You won't see them in your searches further but you can unhide anytime later. Hide this Dealer (Karun) Discover properties by other dealers by hiding those whom you have already spoken to. You won't see them in your searches further but you can unhide anytime later. Hide this Dealer (Vinod Madhavan) Discover properties by other dealers by hiding those whom you have already spoken to. You won't see them in your searches further but you can unhide anytime later. Hide this Dealer (Sathyan) Discover properties by other dealers by hiding those whom you have already spoken to. You won't see them in your searches further but you can unhide anytime later. VGN Minerva, located in Chennai, is a residential development of VGN Group. It offers spacious and skillfully designed 2BHK and 3BHK apartments. The project is well equipped with all the basic amenities to facilitate the needs of the residents. The site is in close proximity to various civic utilities. Where is VGN Minerva located? The project is located in Nolambur, Chennai North. What apartment sizes are available in VGN Minerva? The project offers apartments sized between 1040.0 sqft and 1764.0 sqft. What is the 2 bedroom size in VGN Minerva? 2 BHK units in the project are available in a size of 1040.0 sqft to 1128.0 sqft. What is total area of 3 bhk in VGN Minerva? 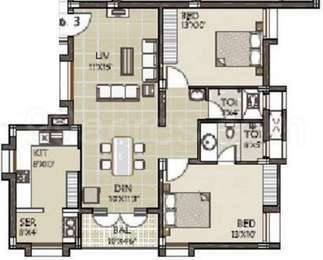 3 BHK units in the project are available in a size of 1764.0 sqft. How much is the total size of VGN Minerva?The project is spread over an area of 12.0 Acres. What is total price of 2 bhk in VGN Minerva? The price of 2 BHK units in the project ranges from Rs. 6200000 to Rs. 7200000. RCC framed structure, Design for earthquake resistance. French door : T.W. door / window with glazed shutters as per Architect design. Toilet door : C.W frame with flush doors (BWP grade) one side plastic film coating. Main door : Brass hinges & fittings. Other door : Godrej SS apple round lock or equivalent SS hinges and fittings except toilet door. Windows : Powder coated/Anodized Aluminium section with 4mm thick clear glass openable. Ventilator : Powder coated/Anodized Aluminium glass top hung . Putty with Acrylic Emulsion painting, Asian paint or equivalent for inner wall. External walls exterior weather shield ICI dulux or equivalent. Melamine matt finish for main door and other doors enamel painting. 24 inches x 24 inches Vitrified flooring tiles. 4 inches Skirting of Vitrified tiles. 20mm granite counter with half nosing. 12 inches x 12 inches Anti skid ceramic flooring tiles. 8 inches x 12 inches ceramic dado upto 5 feet height (i.e) 2 feet above counter. 8 inches x 12 inches ceramic tiles upto full height. Staircase Anti skid step tiles with nosing. 12 inches x 12 inches ceramic tiles for common areas. White colour EWC with Cascade type (parryware or equivalent). White rectangular wash basin (Parryware or equivalent). Fittings Bib Taps & Pillar Taps. Phase Power Supply with concealed PVC, conduit of ISI make copper wiring with Anchor Roma make modular switch or equivalent switches with breaker, tripper & DB box. One fan point, two light points, one fridge point, AC point. Two wall light points, one fan point, two 5 Amps points, one AC point , one baby cradle hook, 2 way switches (2 Nos),TV point & Telephone point. 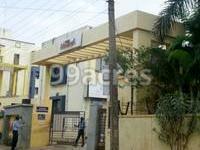 i have a 2BHK flat in VGN Minerva, Nolambur, Mugappair (E). I would like to sell the flat which is 1110 SQ. Ft at the rate of 5,000 / SQ. Ft. Is it the right time to sell the flat. Please advise.